After Generation 1 ended in Japan, Takara continued their tradition of robot anime with a series of shows collectively known as Yūsha, or Brave. The last and best of these, released just before Takara started importing Beast Wars in 1997, was The King of Braves GaoGaiGar! In the middle of a snowstorm, a baby boy is delivered to a childless couple by…a giant robot lion?! Eight years later, while on a school field trip, the boy is caught in the middle of a battle between a robotic kaiju made of garbage and a cyborg piloting the very same lion mecha! But what’s the connection between them? Who is the Gutsy Geoid Guard, and how did they gain control of Galion? Just what was the animation budget for Guy’s hair? And will Jen stop talking about Evangelion? 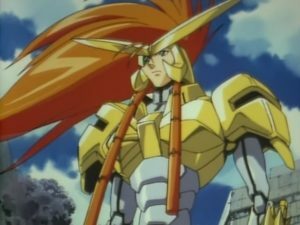 Join us this week as we watch The King of Braves GaoGaiGar Episode 1: King of Braves is Born! The second part of our series wrap-up with special guest Ben Yee! But our own adventure isn’t over, and we still want to hear your questions! Email us at stasispodcast@gmail.com and we might answer them on the show! In the first part of a two-part series wrap-up, we share some final thoughts on the Beast Wars show and toyline and talk about creator involvement in the fandom and recording TV shows on VHS with our special guest Ben Yee! With the Decepticon ship Nemesis and a copy of the Covenant of Primus, Megatron is ready to return to Cybertron and reap some Biblical destruction! Can he be stopped? Is this truly the end of the Beast Wars? (Spoiler: Yes.) And does that mean the end of…this podcast!? (Spoilers: No!) Join us this week for the final episode of Beast Wars, Nemesis Part 2! With Tarantulas dead, Megatron discovers that the late Predacon had found the location of the crashed Decepticon warship Nemesis! Can he raise it from the briny depths of the ocean before the Maximals stop him? Will a seafloor battle finally mark the end of Depth Charge and Rampage’s mutual hatred? And seriously, just how good is the underwater stuff in this episode, right? Join us as we reach the penultimate episode of the series with Nemesis, Part 1! As Megatron puts Quickstrike on trial for treason, the Vok decide to create a Tigatron/Airazor ship-baby to stop the Predacons from any further meddling in the time stream. But will this new Tigerhawk make things worse by destroying the Decepticon Megatron’s spark? Are glowing skulls actually that incomprehensible, or were the Vok just being difficult before? And where did Megatron get that sweet judge’s wig? Join us this week for the last of the “Other V” episodes, Other Victories! Megatron takes control of Optimus Primal to get inside the Ark and steal the spark of the original Megatron! But will the Decepticon leader’s spark give him the same kind of upgrade it gave Optimus? When did Blackarachnia turn into Phoenix? And how many pop culture jokes can we make about the title? Join us this week for Master Blaster! Blackarachnia’s experimentation with the Transmetal driver causes her Predacon shell programming to degrade, forcing her to make a dire choice: let Rhinox attempt to remove it, or slowly lapse into madness and eventually death. But the Predacons won’t let go of their former comrade so easily! Can Rhinox carry out some super 90s VR surgery to save her even while the base is under attack? Is Tarantulas the worst, or is he THE WORST? And what exactly is a “Rubicon” anyway? We’ll discuss all this and more in this week’s episode, Crossing the Rubicon! Megatron’s latest superweapon is so unstable that he needs an organic creature to finish building it. Fortunately he knows just where to get one! But can the Maximals’ little proto-human buddy Una really be trusted to follow instructions? Can Rattrap and Depth Charge rescue her before Megatron decides she’s dispensable? And did Cheetor seriously just criticize violent cartoons in a violent cartoon? Join us this week as we Go with the Flow!